Home LIFA News God Bless Brenda Arthur for speaking the truth, while the cowards hide. Most of you have doubtless heard of Brenda Arthur. She has singlehandedly tied the West Virginia legislature in knots over refugee resettlement and the spread of Islam in her state. She was the one who placed the poster in the state capitol that sparked a big controversy. We Pocket members are not shrinking violets. Here’s the poster. Well, actually Ilhan, everyone condemned the move in a disgraceful show of cowardice and stupidity. They should have congratulated Brenda for reminding them and taken a minute to reflect on what we’ve come to. But is Omar’s not truly a narcissistic statement? One person scribbled ‘assassinate Ilhan Omar’ on ONE truck stop bathroom wall in Minnesota. Has anybody ever tried to count the number of similar scribblings about Trump on public bathroom walls? Or even objected when some public figure says the same kind of thing about Trump? Ilhan might as well be a domestic terrorist for all her shady connections, and is definitely a security risk. She has no business being in Congress, and we hope that the investigations into her document fraud get her where she belongs: in jail or deported back to Somalia where she belongs. There is a fine line between saying what is necessary and going over the top. Some think Brenda went over the top here. All the RINOs went nuts, and one Democrat state legislator kicked down a locked door in his anger, injuring the doorman who got broken ribs. Of course, that is the kind of thing they do. One GOP idiot resigned. Well, if you repeat the truth often enough, people start to wake up and even the MSM has to discuss the issue. Sometimes it takes a provocative statement to initiate the conversation. It should be an opportunity to double down on this message and go on the offensive. 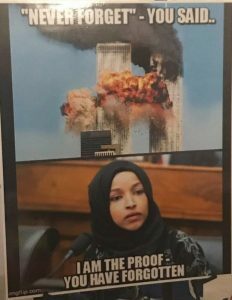 How on earth is someone so blatantly anti-American and pro-Shariah in Congress? Unfortunately, as Trevor Loudon has pointed out many times, there are some 100 odd House members and 20 Senators who couldn’t pass a security clearance to be janitors in the DoD. There needs to be more shouting about this, not less. Thank you for your bravery, Brenda.